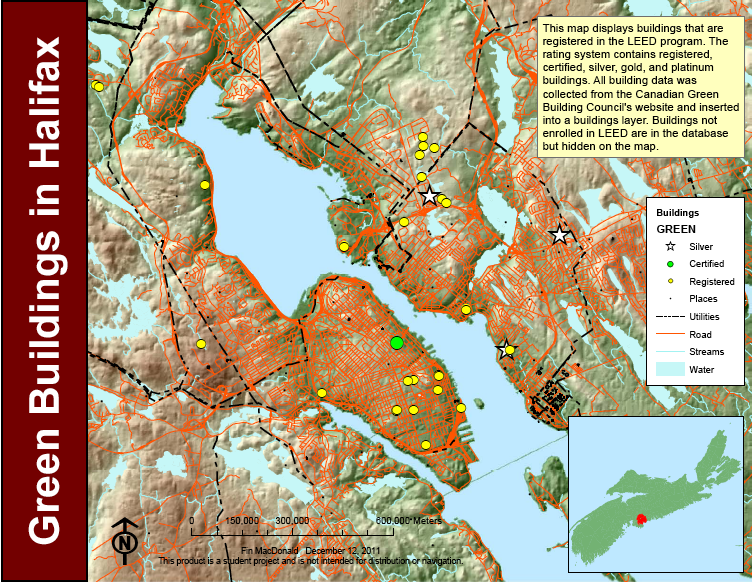 Geographic Information Systems (GIS) are databases that contain geographical information. The leading GIS software is ArcGIS by ESRI. In the past months I have been exposed to both the software, and its uses in the green building industry. I had a chance to talk with some ESRI representatives at Greenbuild this year in Toronto. GIS has much to contribute to LEED and other rating systems as the industry builds momentum. Maps can be used to assess the public transportation of a building, as well as the community connectivity and relative distance to other building types. ArcGIS also creates a geodatabase that the map is based on, and this can contain all sorts of useful data for analysis. A buildings layer that is added to a map can contain a table of values with a row for each building drawn on the map. The tables can contain all sorts of data about the building. LEED points earned, the level of certification achieved, and the architects and engineers on the project are examples of useful data that could be stored. A detailed geodatabase could help future developers decide which LEED points to pursue based on a proposed buildings location. ArcGIS can also create beautiful maps. I’ve created one as an example using the publicly available list of LEED projects in the Halifax, Nova Scotia, Canada area. This list is available on the website of the Canadian Green Building Council (CaGBC). I’ve uploaded the map below.